Offer Details: Cheese Plates are available for purchase during tasting room hours. Our very friendly staff will be happy to recommend the best cheese pairing with our delicious wines. Experience an intimate and un-rushed wine tasting in our rustic elegant – country style Tasting Room. At High Pass our guest’s wine experience is what matters the most. Guests are allowed to bring picnic and enjoy on the pavilion overlooking the Vineyard and the scenic foothills of the Coatal Range Mountain. 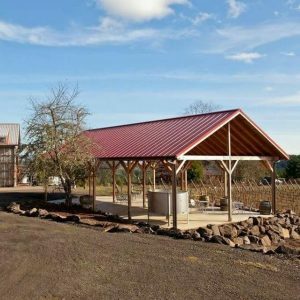 Based in Junction City, Oregon, High Pass Vineyard was founded by Dieter Boehm in 1984 on a 20-acre parcel of land. For more than 30 years, we have been producing some of the region’s best wine grapes. Dieter Boehm is driven by his passion for nature. Inspired by the landscape of the Elbe River Vineyards and the romance of the wine villages, which he experienced while he attended University in Dresden, Germany. He planted his first vines at High Pass in 1985 and a few years later started producing some of the premium wine grapes that gained Oregon international acclaim. Local wineries were willing buyers of his early crops, but he always made sure that there were enough grapes left for him to learn about winemaking himself. High Pass Winery’s first commercial crush occurred in 1994. Since then, we have continued producing exceptionally high-quality wines that have earned wide acclaim. We specialize in a variety of whites including: pinot gris, riesling, and Sauv Blanc. We also host a variety of Roses and Pinot Noirs.